Do you have a tree that’s become too big for its boots? Whether it’s in a back garden or on commercial property, trees can become a nuisance and need trimming down for safety or aesthetic reasons. This is where professional tree surgeons come in. They’ll visit you, evaluate the situation and take action. This could be trimming down the branches or even removing part of the upper trunk. 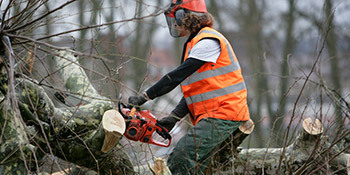 Tree surgeons can offer a range of services and aren’t simply available for cutting down a tree. They can also offer solid advice on the right treatment and maintenance for trees in your garden at different times of the year too. Why will I need a tree surgeon? For managing trees, one of your first thoughts will be whether you can carry out the task yourself. A simple pruning can probably be conducted by most homeowners, but to get a great result without spoiling the tree will often require the services of an expert. By taking matters into your own hands, there’ll be a large amount of waste left over to dispose of. Numerous trips to the tip after packing the debris into black bin liners will be necessary. With a professional service though, the clean-up is all covered in the price. There is also the opportunity to have the trimmings converted into woodchip to use in the garden as well. One of the more common reasons for requiring a tree surgeon is to benefit from more light in the garden. Professionals will often point out that even after reduction the tree will still cast a shadow and instead may remove lower branches to allow more light under the canopy of the tree. You could also require the services of an expert because of damage to a building. Tree roots and branches can cause a serious problem to both residential and commercial properties and need to be properly maintained. If you’re in need of the services from a tree surgeon, comparing quotes is the best way to ensure you get the right price for the work you want completed. Experts can analyse the situation and provide the best outcome too. Complete our FREE online form to receive up to four tree surgeon quotes from vetted and reputable professionals in your area. Project: I have a large conifer that needs reducing in my rear garden. Visit and quote the day following telephone contact. Hedges cut within 2 days - would have been day following visit but rained off. Now my birds can build their nests without disturbance. Job as promised and all cleared up. Useful advice given re planned tree surgery. Very impressed. Homes are given an energy rating depending on exactly how efficient they are and ratings are shown in the data down below. This varies from A, by far the most energy efficient, to G, the very least efficient. With a higher rating you're more likely to have less expensive energy bills as more heat will be kept in the house. You'll be able to boost your home's efficiency with insulation including double glazing, loft lagging or wall cavity insulation. The data below illustrates the several types of homes within Uk. The most common houses all around the UK are detached and semi-detached homes. Other kinds of households consist of terraced houses, flats, converted flats and bungalows. The data underneath offers an indication to the number of properties in Uk that are central heated and non-central heated. Houses are heated by a variety of sources which indicate how pricey annual energy bills will probably be. Examples of central heating include gas, electricity, oil, solid fuel and LPG boilers. Changing the way in which your home is heated can easily see you with cheaper bills. The information below illustrates the spread of properties heated by different fuels. Throughout the UK the most frequent undoubtedly are gas heated properties, followed by electricity and then oil. Biomass central heating boilers are also rising in popularity, heated by renewable products such as wooden pellets or agricultural waste.|Houses in Britain are heated up by a range of fuels, such as gas, electricity, oil, solid fuel and LPG boilers. Each fuel has a varying cost associated with it which means you may find yourself with less costly energy bills by switching the way your house is heated. Even solar thermal panels are being regarded as by many people as a way to cut heating bills for the years to come.